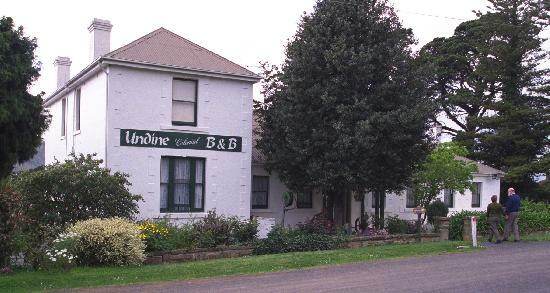 Enjoy this Bed & Breakfast accommodation at Undine Colonial Accommodation, located just 10 minutes north of Hobart CBD. This heritage-listed building - circa 1820 - provides luxurious and spacious accommodation set in a large cottage garden. Explore the sights and attractions in and around Hobart including Cadbury Chocolate Factory, Elwick Racecourse, Moorilla Winery, Derwent Entertainment Centre and Claremont Golf Course. The Colonial Accommodation @ Undine is close to everything that Hobart has to offer and features numerous guests facilities including business centre, direct internet access, faxing facilities, free car parking, guest laundry, massage, secretarial services, outdoor swimming pool, tour desk, bbq, garden, indoor pool, security, babysitting service and daily housekeeping. Indulge in a game of billiard or eight ball in the games room open daily till 9. 30pm. 31 deg. Salt Water Hydrotherapy Pool is available to house guests Monday to Friday between 5. 30-6. 30pm & Saturday & Sunday from 6. 00pm till 8. 00pm other times by arrangement. Roam around our country style garden with huge Lemon tree, fish pond, children's playground and basketball area. . Nearby Attractions : Cadbury Chocolate Factory, Elwick Racecourse, Showgrounds, Moorilla Winery, Derwent Entertainment Centre and Claremont Golf Course. Family 2 Bedroom Apartment : Sleeps up to 4 guests on 1 Queen & 2 Single Beds.